Cannabis in China is illegal since 1985. However, hemp grows in China, and historically has been used for fiber, as well as for some ritual purposes within Taoism. In the 19th century, the majority-Muslim Xinjang region was a major producer and exporter of hashish, with Yarkand being a major center. Tens of thousands of kilograms annually were exported to British India, legally and under tariff, until 1934 when Chinese authorities cut off the legal trade, though smuggling continued for some years after. In 1985, the People’s Republic of China joined the Convention on Psychotropic Substances and identified marijuana as a dangerous narcotic drug, and illegal to possess or use it. The penalty for marijuana possession in China is disputed from various sources, but according to the Law on Public Security Administration Punishments, marijuana smokers shall be detained for 10 to 15 days and fined a maximum of 2,000 yuan. 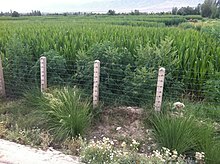 Cannabis plants are widely grown in Yunnan Province, especially around the city of Dali. However, the Yunnan government began an eradication campaign in 1998 to make the province “cannabis free” by 2000, resulting in less wild and commercially grown cannabis. A similar campaign has also caused a rise in marijuana prices in Xinjiang province. According to the Ministry of Public Security in 2015, cannabis use was on the rise among Chinese youth. For those who begin practicing the Tao it is not necessary to go into the mountains. … Some with purifying incense and sprinkling and sweeping are also able to call down the Perfected Immortals. The followers of the Lady Wei and of Hsu are of this kind. ^ Journal of the Society of Arts. The Society. 1871. pp. 647–. ^ S. Frederick Starr (4 March 2015). Xinjiang: China’s Muslim Borderland: China’s Muslim Borderland. Taylor & Francis. pp. 364–. ISBN 978-1-317-45136-5. ^ a b Lin, Li (September 8, 2015). “The lows of getting high”. Global Times. ^ Allen, Greg (May 1, 1999). “China High”. Cannabis Culture. ^ Labrousse, Alain; Laniel, Laurent. The World Geopolitics of Drugs, 1999/1999. ^ Needham and Lu (1974), p. 152. ^ Needham and Lu (1974), p. 151. ^ Rudgley, Richard (1998). The Encyclopedia of Psychoactive Substances. Little, Brown and Company. ^ Joseph Needham, Ho Ping-Yu, and Lu Gwei-djen (1980). Science and Civilisation in China: Volume 5, Chemistry and Chemical Technology; Part 4, Spagyrical Discovery and Invention. Cambridge University Press, p. 213. Alain Labrousse; Laurent Laniel (29 June 2013). The World Geopolitics of Drugs, 1998/1999. Springer Science & Business Media. pp. 85–. ISBN 978-94-017-3505-6. Touw, Mia (1981). “The Religious and Medicinal Uses of Cannabis in China, India and Tibet”. Journal of Psychoactive Drugs. 13 (1): 23–34. doi:10.1080/02791072.1981.10471447. PMID 7024492.